The Yucatan Peninsula’s balmy beaches and warm waters are what has developed it into a major hub of tourist infrastructure today. But what earned this landmass its place in travel books long before modern sun-seekers is its status as the heartland of the Mayans, one of the ancient peoples of Mexico. Long before Europeans redrew the map of the modern Americas, the Mayans of southern Mexico had a civilized empire of cities, towns and roads, with a society of developed social classes and trade relationships with neighboring people. But the Mayan world is not just part of history. The Mayans are a living people, with a different look (often shorter and darker than European Mexicans), different languages (many Mayan tongues are still learned in the home and used as first languages in rural areas), and different food traditions (often coming from local fruits and plants found or cultivated in the tropical landscape). Hopping between one famous site and the next along Quintana Roo’s well-kept highway, it’s easy to miss the wilderness that this area became famous for. 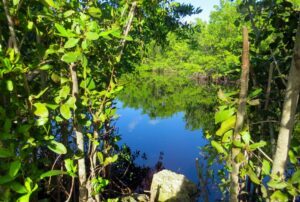 But even in expensive and popular sites, such as Tulum or the big cenotes, you will come face-to-face with the Mayan world in a number of ways – you just need to be able to see them. In hopes of making even a brief encounter with the Mexican wilderness more meaningful and interesting, here’s a quick guide to the Mayan folklore of the natural world. 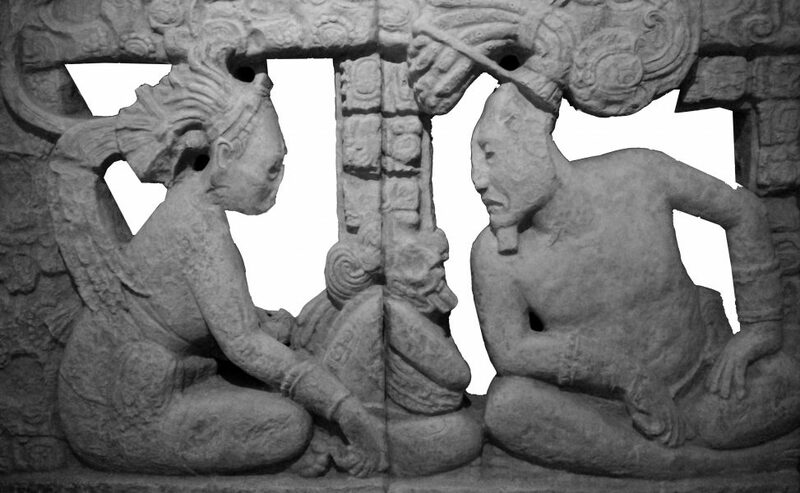 The king and queen of the Mayan pantheon of gods are Itzam Na and his wife Ixchel, whose alter-ego as her older self and the Queen of Heaven is named Ix Chebel Yax. As the prototypical feminine god, Ixchel represents the earth’s power of fertility, and it is she who watches over unborn children and the plants of the forest. She is also the patroness of weaving, medicine and the moon; and as the moon goddess, she is considered responsible for destructive waves, floods or tides. The Master of the Forest is Itzam Na and Ixchel’s child, Yum Kaax. He is usually depicted in Mayan carvings as a young man holding an ear of corn in each hand. He was the god invoked for a successful harvest. Meanwhile, the Mayan religion also attributes some of the elements to the rain god Chac. He is drawn or carved as an old man with two long fangs, often fishing in a cenote. Interestingly, Chac is also drawn carrying an ax, which he uses to make thunder – just like the repeating icon of European mythology, seen with Thor in Scandinavia and Perkons/Perkunas in the Baltic States, of a thunder god wielding a hammer. The cult of Chac has remained one of the strongest in Catholic Mexico, and superstitious rural farmers still make offerings to him for rain. Chac also is a guardian of the four compass directions, with a different name and alter-ego for each of them. Each direction, and each face of Chac, is also associated with a color. So in Mayan art, Chac the white represents north, Chac the yellow represents south, Chac the black represents west, and Chac the red represents east. 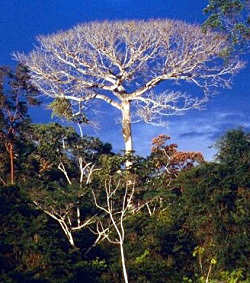 The kapok tree, ceiba in Spanish or yaxche in Mayan, is one of the most notable big trees that populate the jungle of the Yucatan Peninsula, native to the Americas as well as West Africa. They can reach heights of over 200 feet, but when they are young they can be identified by their squat trunks covered with spikes – a relic from prehistoric times when the tree originated, when the spikes deterred megafauna like mammoths from scratching an itch on the baby tree’s trunk and knocking it down. 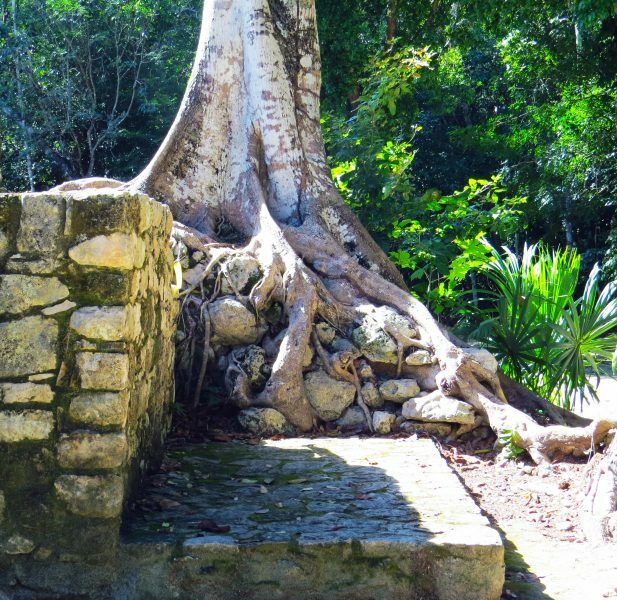 In Mayan cosmology, the kapoc was the tree of life. Today, it is tradition to receive a blessing or hold a ceremony near a kapoc tree. Mayan legend states that four kapocs, at the corners of the earth, are holding up the sky. Only when the forest is gone will the sky crumble and the end of the world arrive. This belief shows how deeply connected the Mayan people were and are to the protection and survival of their beloved rainforest. The copal is a smaller tree with umbrella-like clumps of hanging leaves, which produces a fragrant resin important in ceremonies and magic. This resin is called pom in Mayan, and it is sprinkled on hot coals to create an incense which protects against curses, bad luck or the evil eye. Copal resin was also used in offerings to the gods. The resin is harvested by cutting the bark of the tree and then lighting a controlled ring of fire around it. The heat causes the resin to sweat, and it is extracted once the fire is put out. With controlled burns like this, the Mayan people have been managing this forest for centuries. 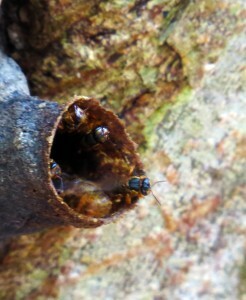 Another ancient Mayan forestry practice is the cultivation of stingless bees. The species of stingless bee that live in the Yucatan are called “melipoma”, and they are endemic to here. Certain native plants cannot even be pollenated by another type of bee. The Mayans considered the stingless bees sacred, calling the stingless bee Xunan Kab, which means “royal lady”. They would cultivate beehives in hollow logs in their villages, usually cutting off a log containing a beehive from a tree, sealing the ends with clay and hanging it from a roof or patio. The honey was then harvested twice a year with a special ceremony. Stingless beekeeping is no easy task, however – even though the melipoma bees don’t sting, they can bite! The honey harvested from the stingless bee is higher in water content and more bitter than honeybee honey, and it is used for many medicinal purposes. The bees themselves are a remarkable species. They rest every seventh day, and they pass down a single beehive from generation to generation for up to 100 years. The beehive is ruled by a queen, but can also be home to up to seven virgin queens, who eventually leave the hive to start groups of their own. Moreover, the bees have a particularly powerful ability to predict extreme weather or natural disasters. Hives have been known to relocate as much as a month before events like hurricanes. The Mayan calendar (and its infamous endpoint in 2012) is well known, but what is not popularly known is that the Mayans actually made use of several calendars. Just as the Gregorian, Muslim and Chinese calendars reflect different ways to keep an even measure of a year, but do not always coincide date-to-date, the Mayan notion of time involved simultaneously-moving calendars. Which calendar to measure by depended on what task needed to be done: naming a child, sowing crops, etc. 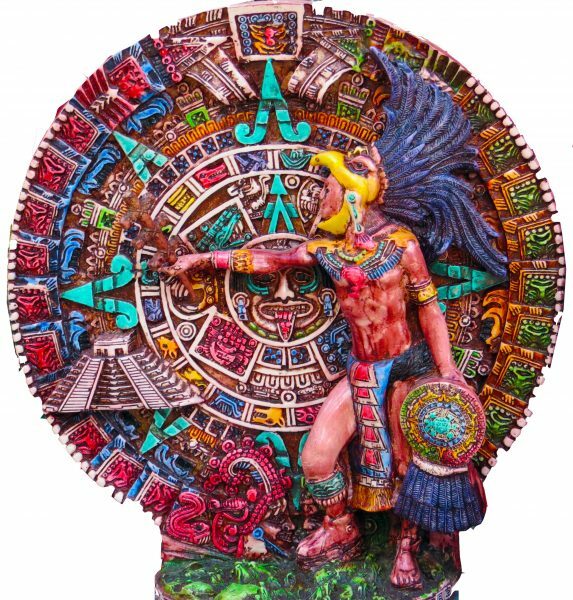 The Mayan calendars included a solar calendar; a calendar based on Venus; and a “sacred” calendar called the tzolkin that was only 260 days long. This calendar, and how it coincided with the other two, was the most important for astrology. All three calendars would line up exactly for one year every 104 years. Great lengths of time were measured in 365-year periods, mirroring the 365 days of the solar year. In addition, there was a fourth, lunar calendar, which was used only for fortune-telling. The Mayan awareness of the seasons and the calendar continues today in sometimes unexpected ways. On February 1st, 2015, the state of Quintana Roo enacted the start of a new time zone in Mexico, putting it one hour ahead of the neighboring states of Campeche and Yucatan. That means that the Riviera Maya area will now be one hour ahead of Guatemala and Belize, which technically extend further east; while it will share the same time as Jamaica, Panama, and the east coast of the United States. The change was enacted to increase afternoon daylight hours, and has already boosted the tourist industry and created energy savings in the state’s airports. So, in a way, the southeast of Mexico is still following the tradition of shrewdly observing the passage of time, and making life richer by using what they see. It is almost fitting that the state of Quintana Roo will now exist in this mystical time-slip that defies geography. 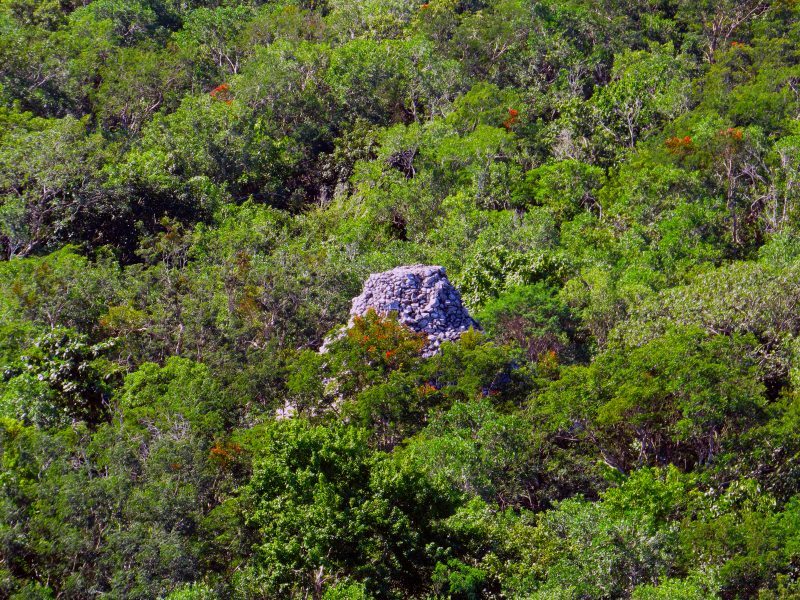 Much of the Mayan heartland is, after all, a land lost in time. To see it, you just need to know what you’re looking for. Aleksandroff, Svetlana. 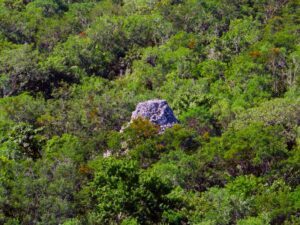 Plants of the Mayan World. Playa del Carmen, MX : Imago, 2012.